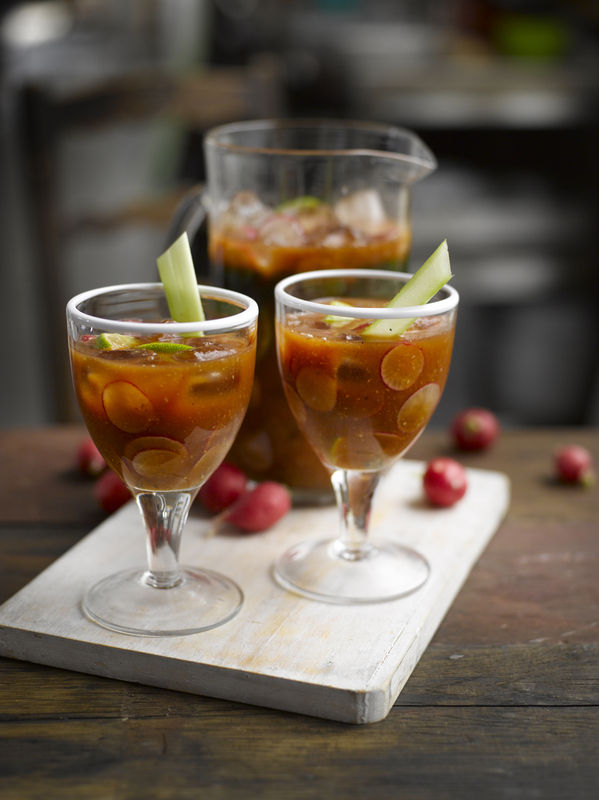 A delicious Bloody Mary recipe complete with retro celery sticks and the requisite balance of fresh and bold flavours. 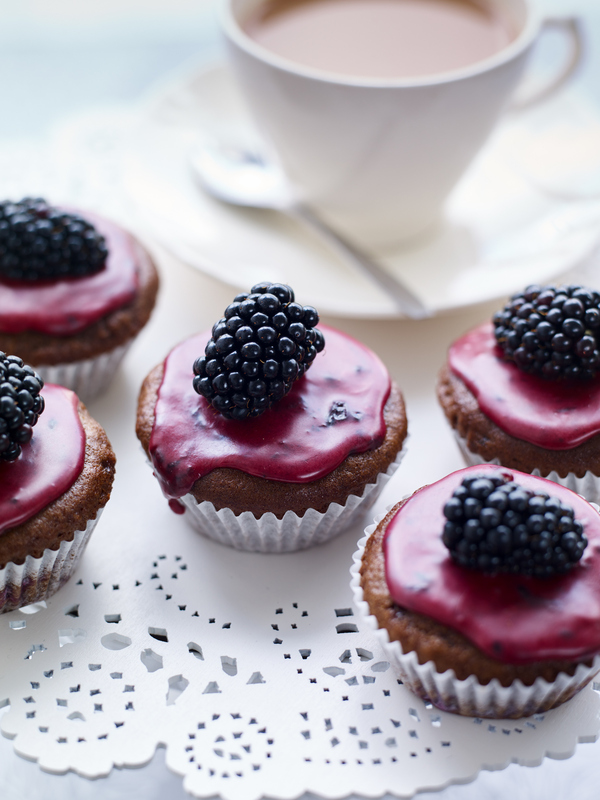 This can be made to taste depending on your guest. The addition of the radish rubbing shoulders with the lime presents a really effective new twist to a classic drink. Try to use a selection of tomatoes so that you get a variety of colour, size and flavour. For the pesto, put 20g basil leaves, pine nuts, 1 clove crushed garlic and 4 tbsp olive oil into a food processor and blitz into a paste. Scoop into a bowl and stir in the Parmesan and some salt to taste. Cut the loaf of French bread across into 3 evenly sized pieces, then each piece in half, horizontally. Mix the soft butter with the remaining crushed garlic and some sea salt flakes to taste. Thinly slice the tomatoes, discarding the top and the bottom slices, lay them out on a board and season with salt and pepper. Halve the avocado, remove the stone, and peel. Cut across into thin slices. Place the pieces of French bread on a baking tray and grill on both sides until golden. Remove from the grill and spread the cut face of each piece with some of the garlic butter. Slide them back under the grill briefly, until the butter has melted into the bread. 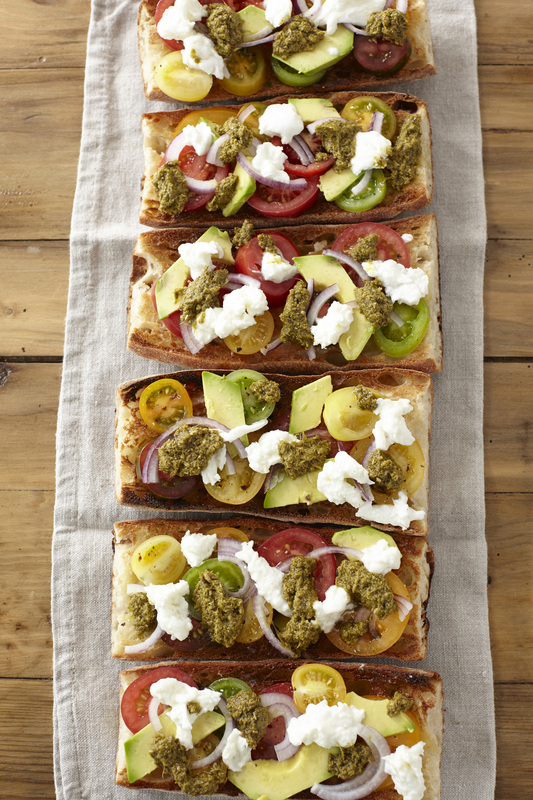 Quickly remove the garlic bread from under the grill and top with the slices of tomato, avocado and red onions. Using a teaspoon, scoop small bits of the burrata or mozzarella onto the top of the toasts. Drizzle over some of the pesto, garnish with the basil leaves and serve while the garlic bread is still hot.